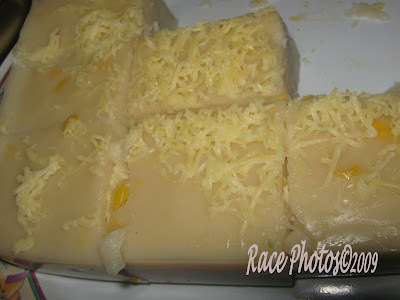 This is the very yummy maja with lots of cheese inside and out, just looking at this pic makes me want for more but no there aren't anymore of this as we consumed all of this very fast :-) This is a gift and pasalubong for my Mom from one of her wedding sponsored godchildren, specialty of Rina and her hubby Santi, a bank manager with a great flair for cooking. I can't check out any more sites. My mouth is watering too much.